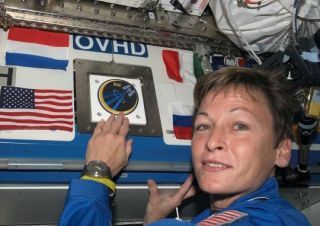 Veteran NASA astronaut Peggy Whitson places her mission patch on the International Space Station during the Expedition 16 mission. This month, the International SpaceStation hit the 10-yearmark as an inhabited outpost in space. One person ? NASA astronautPeggyWhitson ? has personally contributed quite a chunk of that total time,havinglogged more than a year in space over the course of two long-durationstints onthe station. NASA and 15 other countries beganbuilding the InternationalSpace Station in 1998 with module launches and construction,but it wasn'tuntil Nov. 2, 2000, when the first crew ? one American and two Russians?boarded the orbiting lab. Since then, the station has swelled in sizeandpopulation. Today, the station's structure is as large as a footballfield, hasenough living space as the inside of a Boeing 747 jumbo jet andsupportsrotating crews of six people. SPACE.com: Howdoes it feel to see thisanniversary for the station? Peggy Whitson: Insome ways I think it's kind ofincredible. It's miraculous to have had peopleon orbit for 10 years continuously. The International SpaceStation hasgrown dramatically since that first crew went aboard. You know, we've survived things notworking out exactly theway we would have liked, in terms of having the shuttles go down for acoupleof years after the Columbia accident and before return to flight. Butthroughall that we've managed to maintain human presence up there and tocontinue togrow and build the International Space Station now in its completeform. Q: Doyou think the daily mode of an astronaut'slife on the station now is much different than it was 10 years ago? A: Yes, yes, itis. Initially, in the early stages itwas primarily just assembly, getting the kinks out of the operatingsystems,making sure they worked the correct way. We were doing research earlyon ? Imean, on my first expedition, it was a utilization mission ?utilization is aterm we use synonymously with doing more scientific investigations. Sowe hadphases where we were doing more research. But the phases traded offwithassembly as well. With Columbia, once we got theshuttle flying again, welimited the number of shuttles we were flying and had to optimize fortheassembly phase throughout the rest of the shuttle flights. So theselast fewshuttle flights were providing the consumables and up-mass and sparesthat wethink we'll need that are easier to deliver on the orbiter. Q: Doyou have anything planned at the astronautoffice to celebrate the anniversary? A: Actually we'rehaving, coincidentally, theastronaut reunion at the same time. So that'll be fun and interestingfor us tobe celebrating and getting together with all the folks, the formerastronautswho've gone away into either space business or other business, and getbacktogether with everyone and celebrate that history of 10 years ofexperience. Q: Howgroundbreaking do you think the InternationalSpace Station is? A: I would saythat it's somewhat of a miracle thatwe were able to put this thing together from 16 different countries,when manyof the pieces were never fit-checked on the ground. To be able to getall thosepieces to fit together and integrate and communicate with each other,you know,the computer systems and everything, I think it's amazing that it'sworked outas well as we thought it would. Or it's better than we could have hopedin manyways. I think the legacyofthe space station will be that we can do something thistechnically complexin an international way. Q: Doyou think the station has a long futureahead of it? Q: Whathave we learned about working in spacefrom the station? A: Well, there'resome interesting things we weren'tquite expecting. For instance, feathering (twisting) the solar arrayswhenthey're in eclipse to reduce the drag actually turns out to besomething significant.We've learned how to just control the station with less requirementsforthrusters based on a lot of different knowledge we've gained just fromexperience of flying the station for years. In terms of the human body we'velearned a lot about countermeasures that are necessary to try to protect against bone loss. Ithink we'redoing a lot better in that arena than we were when we first started.We'reseeing improvements in crew members returning based on the exercisehardware.We've also been testing some bisphosphonates that minimize or reducethe amountof bone demineralization. We have hopes that those may also bealternativeoptions. So there's a whole gamut of thingsthat I would consideroperational learning points that we've gotten from the station. Plus, there've been the basic scienceprinciples that havebeen understood better, or differently than we expected maybe is abetter wayof saying that, in that environment where there is no gravity. Q: What are some of the hardparts for you of living inspace? A: It's a hugeprivilege to be up there and it'sprobably the most satisfying, gratifying job on a day-to-day basisbecause youknow that everything you're doing is contributing to keeping thestation alive,to keeping the program moving forward, you know. So when you'recleaning airvents with a vacuum cleaner or something you don't think of it as muchas youwould if you had to do that in your house, you wouldn't gripe about itquite asoften. It's obviously, you know, there'smore drudgery than youmight want to imagine. But at the same time, being able to say, 'Hey,what I'mdoing is helping the station.' So I think there are fewer things likethat thatyou get as tired of. Sure, everybody does, but there are fewer thingslikethat. If I had to pick one thing that Ithought was the mostdifficult, after some point in time, the food gets pretty boringbecause youhave a finite number of selections, and so that becomes old after awhile. Ourfood folks have done a really great job of trying to improve thevariety andthe selection. On my first flight we only had an eight-day food cycle,and onmy second flight we had a 16-day food cycle, so you know, that wasdramaticallyimproved. But it's still not the same as being able to go out and pickwhichrestaurant you want to go eat at. So you run out of new choices after awhile.That gets old. But again, it's still a small priceto be a part of thatvery special day-to-day operations on orbit. Q: What are the mostexciting parts of life in space? A: I definitelythink being able to look out thewindow is one of the most incredible experiences. On my first flight, Idon'tknow if maybe it's a function of time, or if I was less stressed on mysecondflight, but just being able to tell what part of the planet we wereflying overby the reflected light coming through the window ? that was prettyspecial. Tobe able to say, 'Oh, we're flying over northern Africa now,' because ofthewarm peachy glow of the light coming through, that was really special.Just toadmire the beauty of the planet. And take a little bit more time tojust be inawe of it all. Q: How do you think theupcoming retirement of the spaceshuttles next year is going to impact the station program? A:Well, the shuttleretirement is obviously going to impact us. The up-masscapability of theshuttle is incredible compared to any other launching vehicle, so we'llhave tocompensate with many other smaller vehicles for up-mass. The biggest problem that I anticipatewe're going to have isgetting down-mass, which is important for some types of investigations.So Ithink we're going to have to get really creative or come up with otheralternatives so we can get some capability to bring things home so wecaneither get research results back that we need. Obviously, there's a lotofstuff we can do with data electronically, but there are some thingsthat youactually need a physical sample for. And so I think that's going to bea factorfor some types of investigations. But there are some ideas out therefor how they can modifyor develop capabilities that would actually return samples and hardwareif weneed it. I know some folks are going to be looking into that. Poll:Do You Think The International Space Station is Worth $100 Billion?